Mix them all and refrigerate for at least 4 hours before do as your ice cream machine’s instructions. Then you have your dark choc cinnamon ice cream. I’m sorry I don’t have any picture by now. However, may I suggest you one more thing that also goes well with this ice cream? Mix warm water + yeast + 1 tbsp sugar together, let stay for 10 mins. Mix well flour, salt, 1 tbsp sugar, leaves and paprika powder together, then combine the flour mixture with the yeast mixture, and the olive oil too. Knead for 7-10 mins until the dough is elastic and just a bit sticky. Form a ball and put into a greased big bowl, cover with plastic wrap. Let stay for 1 hour or until double size. Preheat the oven at 175 degree C.
Then you have 750 gr dough. Divide into 30 small balls (25 gr each) and roll into 9″ stick. Place them 1″ away from each other. Let rise for 30 mins. Bake in 12-15 mins until golden. 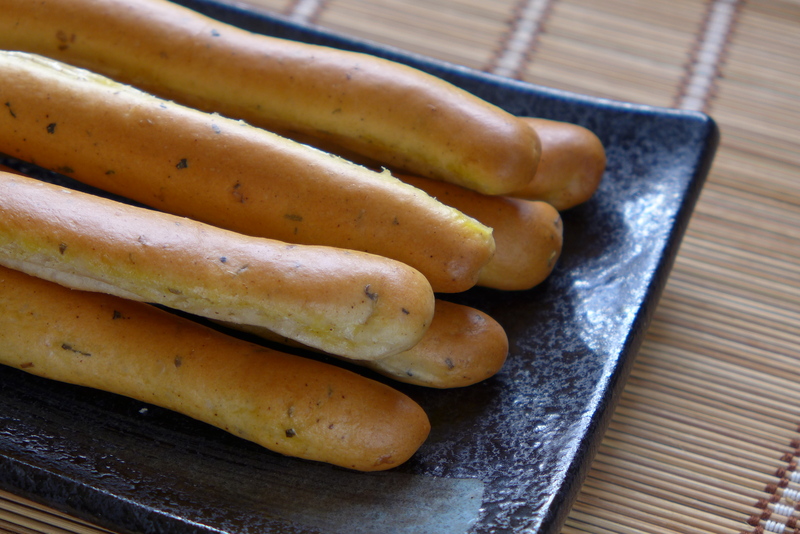 Brush the hot bread sticks with margarine. Serve warm with chili sauce and mayonnaise, or with the chocolate cinnamon ice cream! Store in airtight container. If you want, you can fry them. It doesn’t sound really healthy but just like doughnuts, it tastes awesome! < Previous Antioxidant food but full fat, is it still healthy? I love cinnamon fragrance too, especially on oatmeal.